Fort Garland, Colorado by Kathy Weiser. 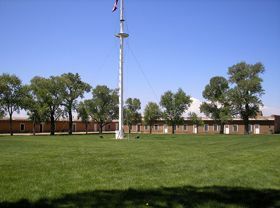 Established in 1858 to protect the settlers in the San Luis Valley, then part of New Mexico Territory, Fort Garland replaced Fort Massachusetts, just six miles to the north. The earlier outpost of Fort Massachusetts had proven to be a poor location choice due to its swampy land and vulnerability to attacks. 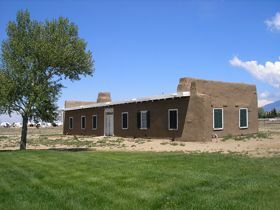 The new fort, comprising of some 20 adobe buildings, was named for Brevet Brigadier General John Garland, then in command of the Department of New Mexico. For the next 25 years the fort, which could accommodate two companies of 100 men and officers, would be called home to a number of different companies of infantrymen, mounted riflemen and volunteers. When the Civil War broke out in 1861, Colorado had only two army posts — Fort Garland and Fort Lyon, because the local Indians were at peace with the settlers at the time. At that point, Fort Garland was manned by a regiment of some 200 volunteers, who were called on to march south to bolster Union forces against the Texas Confederates. In March, 1862, the soldiers defeated the Confederates at Glorieta Pass located at the southern tip of the Sangre de Cristo Mountains, southeast of Santa Fe. The battle would be the turning point of the Civil War in New Mexico Territory. After the Civil War, in 1866, Kit Carson, who had been promoted to a Brigadier General for his part in the Battle of Valverde, also in New Mexico, was given command of the fort. Carson, who had a long history in working with Native Americans, was tasked to keep the peace and negotiate with the Ute Indians, who had inhabited the Central Rocky Mountain region for centuries. Successful in this task, relative peace reigned in the San Luis Valley and the valley’s settlements prospered. The next year, due to health reasons, Carson moved to Boggsville (near present day Las Animas) to become Colorado’s Superintendent of Indian Affairs. He died there in 1868. For the next decade, the town of Fort Garland became the San Luis Valley’s key commercial center as more and more white settlers came to the area. In 1876, the fort was called home to the Ninth Cavalry of the famed Buffalo Soldiers, whose primary task had become again, to subdue the Ute Indians who were rising up again due to the large number of prospectors flooding the state. In 1879, when the Ute killed Indian Agent, Nathan Meeker and his staff at the White River Agency, the garrison at Fort Garland was considerably enlarged, and the fort served as a base of operations against the Indians. However, by 1880, the Ute had been forced onto reservations in the southwestern part of the state, escorted by a Fort Garland battalion. With peace on the Colorado frontier at hand again, the troops at Fort Garland were reduced again. In 1883, the fort was abandoned as a military post. For the next several decades the fort’s old buildings survived as they were adapted for various civilian uses. 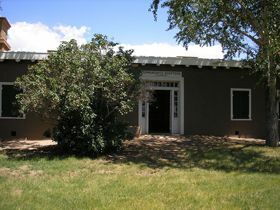 In the 1930s the properties were acquired by the Colorado Historical Society and has operated as a museum ever since. Fort Garland, Colorado Officers’ Quarters by Kathy Weiser.